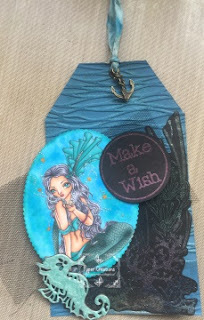 Pyper Creations: Mermaid Birthday Tag- Using Ching Chou Kuik "Magic Wish"
Mermaid Birthday Tag- Using Ching Chou Kuik "Magic Wish"
Hello everyone!! I got to do some crafting just for fun this week! And so much fun it was!! I have missed not getting to color some of my favorite artists just for fun especially my Ching Chou Kuik images!! Its Ching Chou Kuik's birthday this month so her DT is throwing a celebration challenge in her honor in the Facebook Group and I had time to play along!!! 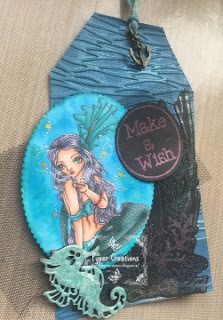 I used the beautiful Magic Wish digi to create this fun birthday tag in her honor! I've been practicing creating a water color looking background with my copic refills... how did I do? 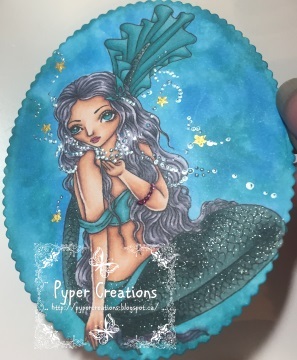 I used some Liquid Pearls for the bubbles; perfect pearls painted on for the stars; and some wink of stella for the tail and its soooo shiny!!! I tried using distress inks in an embossing folders to create a multi-tonal background and then clear emboss on top for a shiny multi-tonal but that didn't work but the little bits of ink that did get on the background allowed the embossing powder to stick so it ended up creating a really cool fluid background. 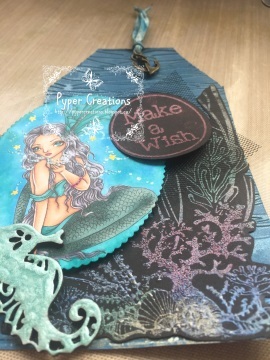 All the coral, seaweed and see life are stamped with a Kaiser Craft stamp and then my own blends of Perfect Pearls embossing powders. I sprinkled the different colors in all different places to highlight the different foliage and then heated it up. The end result is so shiny and colorful!! See sooooo shiny!!! I coated a chipboard seahorse with liquid pearls too. Then my Cricut cut the sentiment for me. I love that my Cricut will do the writing for me! I designed the circle set it to write and put in a Ranger Perfect Medium Pen. 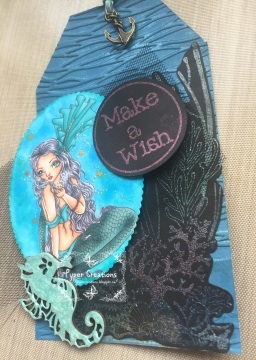 The sprinkled it with my homemade Interference Red Perfect Pearl embossing powder and ta-da! Thanks so much for popping in today to see what I've been up to!! Can't wait to see you all back again!! This is lovely! I'm also excited to learn there is a site specifically for faery folk! Wow! Your tag is beautiful. I like that my cricut will write the sentiments too. The new explore is so versatile. There are so many beautiful elements to your work here. Thank you for sharing your immense talent with us at Fantabulous Cricut. Amazing creation! So pleased that you shared it with us at the Simon Says Stamp Wednesday challenge! This is gorgeous Sarah! I love that you used your Cricut to write the sentiment - and that embossing powder is so pretty :) So glad you joined us for the FCCB challenge!! Stunning creation! The background looks amazing!